Having won more titles than any of their competitors in Greece, Olympiacos are considered the biggest club in the country. They also have the biggest fan base, another element that plays its role in giving them the unofficial title of the number one club in Greece. 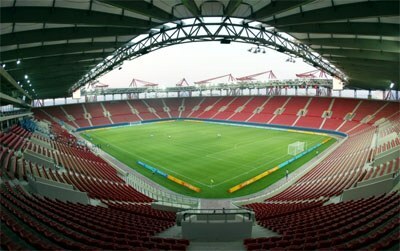 Karaiskakis Stadium, the home of Olympiacos. “Olympiacos Football Club” is how the team are called in English, but in Greek the full name is much longer. “Olympiakos Syndesmos Filathlon Peiraios”, often abbreviated to “OSFP”, means Olympic Club of Fans of Piraeus. This is the name chosen in 1925, when Olympiacos were founded after the merger of two preexisting clubs. Piraeus is the biggest port city in Greece, adjacent to Athens, so it is no surprise that historically the biggest rivals of Olympiacos have been Panathinaikos, the biggest club of Athens. Red and white have always been the colors of Olympiacos. Red was chosen as the color of passion, signaling the club's ambition to win at all levels. White is the color or purity, representing the determination of Olympiacos' founders to play and win fairly. The name and the crest were inspired by Ancient Greece and its original Olympic Games. The most used nickname for the club is “Thrylos”, Greek for “legend”. The team are also called “Erythrolefkoi”, “Red and Whites”. It is no coincidence that Olympiacos maintain a very friendly relationship with another team dressed in red and white, Belgrade's Red Star. Olympiacos have always been playing at the place where their modern Georgios Karaiskakis Stadium (named after a Greek national hero of the 19th century) has been standing at since 2004, after its impressive – total – reconstruction. It was the first modern football-specific stadium in Greece, and a source of controversy as well. Olympiacos have always claimed that they are the rightful owners of the stadium, while their opponents insist that the facility was practically gifted to them by the Greek State. With Piraeus being Greece's biggest, and one of the Mediterranean Sea's most important port cities, it is not surprising that historically it has been mostly shipping magnates owning the club. Olympiacos have been considered for decades a rich institution. No proof is bigger than the fact that in 1988 they signed Hungarian star Lajos Détári from German side Eintracht Frankfurt, in what was the second most expensive transfer in the history of the game back then. Only Napoli had spent more before that, to sign Diego Maradona from Barcelona. Interestingly, not too long after that, the president/owner of Olympiacos (Giorgos Koskotas) who signed Détári, ended up in prison, convicted of committing a series of corruption-related crimes. It was in the late 90s though when the financial gap between Olympiacos and their competitors in Greece started growing even bigger, with the club benefiting from their almost yearly participation in the lucrative UEFA Champions League group stage. Détári is by no means the only world-famous player to have worn Olympiacos' jersey. The list is long, and it keeps growing. Rivaldo, to name just one, signed at the Piraeus club in 2004, aged 32, spending three very successful years with the team. Right or wrong, in the late 90s Olympiacos started earning the unofficial title of “the favorite club of each Greek Government”. Many of the titles subsequently won, were credited by Olympiacos' opponents to refereeing decisions, with the Piraeus club seen as the dominant force within the Greek Football Federation. No player has scored more goals for Olympiacos than Giorgos Sideris. Standing at 1.85m, in times when this height was rather uncommon in Greece (the 60s), Sideris was almost impossible to stop. He spent practically his entire career at Olympiacos, scoring more than 220 goals in the Greek Championship alone. Kyriakos Karataidis, a defender mostly characterized by his raw dynamism rather than anything else, holds the record of the most appearances for Olympiacos, playing in more than 360 games between 1988 and 2001. Olympic Games winners in Ancient Greece used to be crowned with olive wreaths. This is what the adolescent in the crest of Olympiacos has around his head, with the figure, as well as the club's name, inspired exactly by the Olympic Games in ancient times. The four words in the red circle are the full name of the club in Greek (Olympic Club of Fans of Piraeus). The year (1925) is when the club were founded. The four stars were added in 2013, when Olympiacos won their 40th national championship.